A group of scientists from ITMO University in Saint Petersburg has put forward a new approach to effective manipulation of light at the nanoscale based on hybrid metal-dielectric nanoantennas. The new technology promises to bring about a new platform for ultradense optical data recording and pave the way to high-throughput fabrication of a wide range of optical nanodevices capable of localizing, enhancing and manipulating light at the nanoscale. The results of the study were published in Advanced Materials. A nanoantenna is a device that converts freely propagating light into localized light compressed into several tens of nanometers. The localization enables scientists to effectively control light at the nanoscale. This is one of the reasons why nanoantennas may become the fundamental building blocks of future optical computers that rely on photons instead of electrons to process and transmit information. This inevitable replacement of the information carrier is related to the fact that photons surpass electrons by several orders of magnitude in terms of information capacity, require less energy, rule out circuit heating and ensure high velocity data exchange. Until recently, the production of planar arrays of hybrid nanoantennas for light manipulation was considered an extremely painstaking process. A solution to this problem was found by researchers from ITMO University in collaboration with colleagues from Saint Petersburg Academic University and Joint Institute for High Temperatures in Moscow. The research group has for the first time developed a technique for creating such arrays of hybrid nanoantennas and for highly accurate adjustment of individual nanoantennas within the array. The achievement was made possible by subsequently combining two production stages: lithography and precise exposure of thenanoantenna to a femtosecond laser, an ultrashort impulse laser. One practical application of hybrid nanoantennas is ultradense data recording. Modern optical drives can record information with density around 10 Gbit/inch2, which equals the size of a single pixel of a few hundred nanometers. Although such dimensions are comparable to the size of the nanoantennas, the scientists propose to additionally control their color in the visible spectrum. This procedure leads to the addition of yet another 'dimension' for data recording, which immediately increases the entire data storage capacity of the system. Apart from ultradense data recording, the selective modification of hybrid nanoantennas offers new designs of hybrid metasurfaces, waveguides and compact sensors for environmental monitoring. In the near future, the research group plans to focus on the development of such specific applications of their hybrid nanoantennas. The nanoantennas are made of two components: a truncated silicon cone with a thin golden disk located on top. 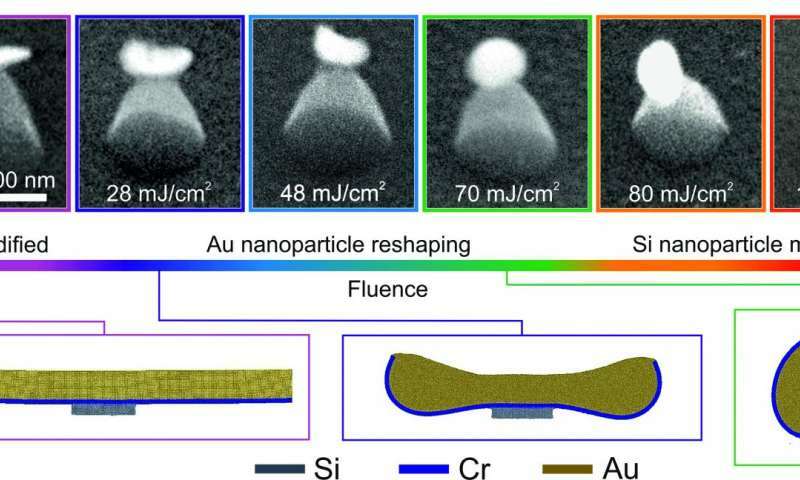 Thanks to nanoscale laser reshaping, it is possible to precisely modify the shape of the gold particle without affecting the silicon cone. 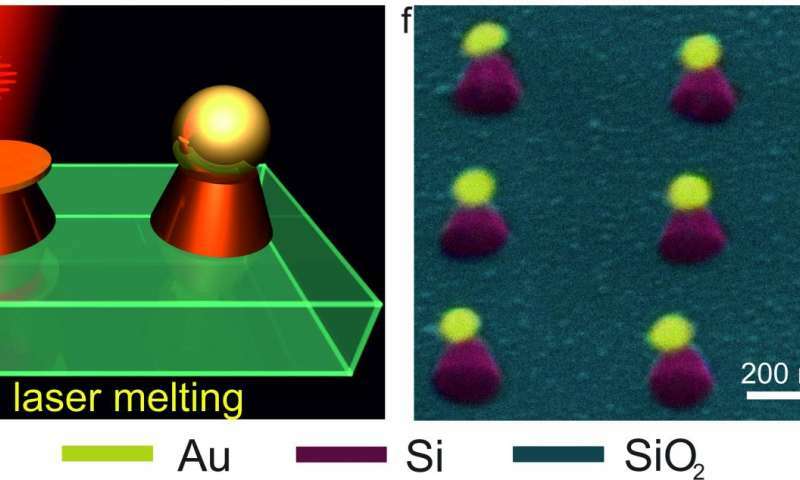 The change in the shape of the gold particle results in changing optical properties of the nanoantenna as a whole due to different degrees of resonance overlap between the silicon and golden nanoparticles. "Our method opens a possibility to gradually switch the optical properties of nanoantennas by means of selective laser melting of the golden particles. Depending on the intensity of the laser beam, the golden particle will either remain disc-shaped, convert into a cup or become a globe. Such precise manipulation allows us to obtain a functional hybrid nanostructure with desired properties in a flicker of a second," says Sergey Makarov, one of the authors of the paper and researcher at the Department of Nanophotonics and Metamaterials of ITMO University. Contrary to conventional heat-induced fabrication of nanoantennas, the new method raises the possibility of adjusting individual nanoantennas within the array and exerting precise control over the optical properties of the hybrid nanostructures. "Our concept of asymmetric hybrid nanoantennas unifies two approaches that were previously thought to be mutually exclusive: plasmonics and all-dielectric nanophotonics. Our hybrid nanostructures inherited the advantages of both approaches—localization and enhancement of light at the nanoscale, low optical losses and the ability to control the scattering power pattern. 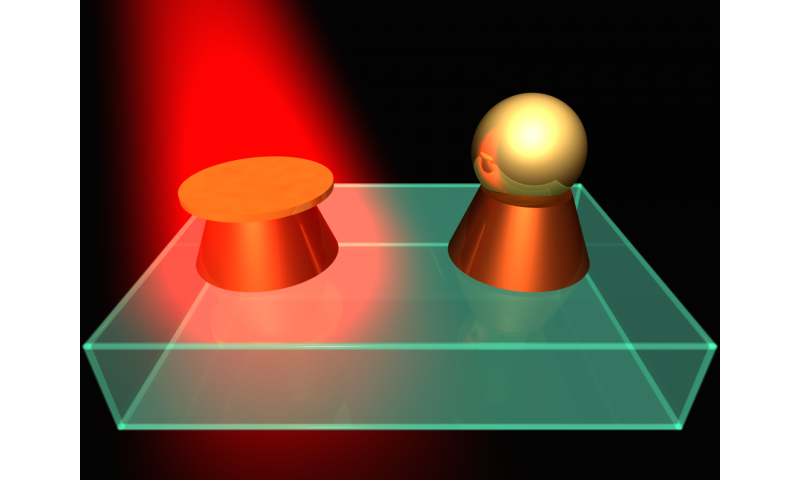 In turn, the use of laser reshaping helps us precisely and quickly change the optical properties of such structures and perhaps even record information with extremely high density," says Dmitry Zuev, lead author of the study and researcher at the Department of Nanophotonics and Metamaterials of ITMO University.